Baltimaade sümfooniaorkestrite festival, Riia, 24. november 2018. Foto: Mārcis Gaujienietis. 24th November 2018 saw the opening of the Baltijas Simfoniskais Festivāls 2018 in Trīs Orķestri Un Trīs Diriģenti uz Vienas Skatuves. 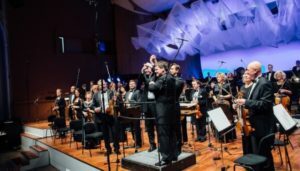 The festival is an annual united celebration between the Baltics states, where this year, the opening concert included the three national symphony orchestras into one concert, with three conductors and four varying pieces. I had the pleasure of not only attending the event but being a part of the pre-concert panel where we discussed various curiosities regarding the Baltic states and their musical past. The first three works exploited the orchestra showing off their nations’ music before a tour de force finale where the three orchestras huddled together on the stage to perform Michael Daugherty’s Time Machine. After the formalities, the concert started with the homegrown Latvian National Symphony Orchestra playing a brand new work by Kristaps Pētersons. I was quite intrigued to see this new work, one because the size of the orchestra was gargantuan, to the point that if the composer did not use spatial placement of instrumentalists the stage would probably overflow with musicians. I tend to avoid reading the programme notes before a play through, but I found myself flicking through the general information and looked at Pētersons programme note for Mūzika lielam orķestrim I became slightly cautious. The composer highlighted that many of his works depend on a dyadic relationship between ‘chaos’ and ‘order’ or ‘construction’ and ‘destruction’; and so, within this piece he actively aimed to exploit that dynamic. When composers become aware of their habits that can become problematic because it can often lead composers to become mechanised versions of themselves or even parodies; not to suggest compositional awareness is a problem, but the problem is when the composer tries to force their personality into a formula. Thankfully, I was not disappointed, the work was rather striking and magnificently executed. Andris Poga was a particularly remarkable conductor leading all elements with ease and a cool attitude that would make you forget many of the musicians could not see his beat. The piece did as it described it would do, but not in a formulaic manner, but in an almost matured manner. Pētersons is really blossoming into something strong with this piece. The control of the space, the orchestration, the energy, and the conversation between the elements was elegant. The orchestra were on fine form and it was a great way to start the concert. After lots of shuffling and tactical manoeuvres, the Lithuanian National Symphony Orchestra had taken their seats under the baton of Gintaras Rinkevičius to perform the national treasure Jūra by M.K. Čiurlionis. It has been a long time since I indulged on some Čiurlionis, with the exception of my own terrible renditions on my piano at home, so this performance was a welcome dish for my appetite. From the start, it was obvious this was the orchestra’s bread and butter repertoire, they were so innately in tune with every musical gesture and Rinkevičius truly seemed to be within his element. The performance was filled with enthusiasm and love, which is something I have always admired about Lithuanian performers; when they truly love a piece, it is almost like it is a physical segment of their being. I cannot really question the piece, it was done beautifully, my only two thoughts is why hasn’t Čiurlionis received the international support he is due? And is there a composer after Čiurlionis that Lithuanians love as much? I do not think that is possible, however in the context of this concert, who cares the performance was wonderful. After even more navigation, the Estonian National Symphony Orchestra came to the stage to perform Sow the wind by Erkki-Sven Tüür. Tüür is a composer I have a truly deep admiration of, and his most recent works have been particularly inspiring due to their genuine concern for the fate of the natural world around him. I have had the pleasure of witnessing quite a bit of Tüür live, as he enjoys quite the international support, however I had never had the pleasure of an Estonian orchestra performing it; in short I can say it was truly worth the wait. Mihhail Gerts and the orchestra were truly magical. Like Andris Poga, Gerts had a wonderful cool and calm demeanour, almost like Tüür was his warm-up repertoire, the power and passion came so naturally to him with what looked like very little physical effort. The piece was full of all the things I love of Tüür, particularly in his most recent works, but the added energy that came from the Estonians performing it gave it that joie de vivre that cannot really be replicated. It was the perfect piece to round off the marathon first half, and I was in awe watching Mihhail Gerts’ conducting. After the interval, came a significantly shorter half, but what it lacked in timing it made up for it with the number of conductors, musicians, and fun being had on stage. Michael Daugherty’s Time Machine was a good choice as it was technically proficient that all of the conductors had serious work to maintain cohesion, and enough energy to truly take advantage of the massive forces. The first movement did not strike me, and I feared the use of multiple conductors was more for show than for need. But the second movement was filled with greater drama, energy, and sheer necessity for itself. It was intensive, to the point that the boy behind me, who somehow managed to sleep throughout the first half, was captivated for the entirety of the work. I think out of everyone involved, I felt the brass had the most fun, as in the final climax they truly let rip and were filling the hall on their own, regardless of the rest of the massive orchestra. Sadly, as a critic, I have to highlight things that were not great; even if it is just to look like I am not being too soft in my opinions. The only real worry was the balance of the repertoire, namely the length of each half was rather ridiculous, but that being said it was almost impossible to do anything different, and even if there was the response of the audience at the end really signifies the success and importance of the festival. While I lived in Vilnius, I was always saddened by how disparate the three Baltic states were musically, however if more events or festivals like this, which simply celebrate and share native talent and joy, existed then the future of Baltic music making would be truly and profoundly positive, and arguably a rival of the world.